Billy Collins writes one particular kind of poem, and he writes it well. A Collins poem is recognizable by its shape on the page (stanzas of three or four lines, of medium length), by its tendency to flutter from its point of origin for a just a moment, and then alight again a few yards away, like a sparrow on a sidewalk. 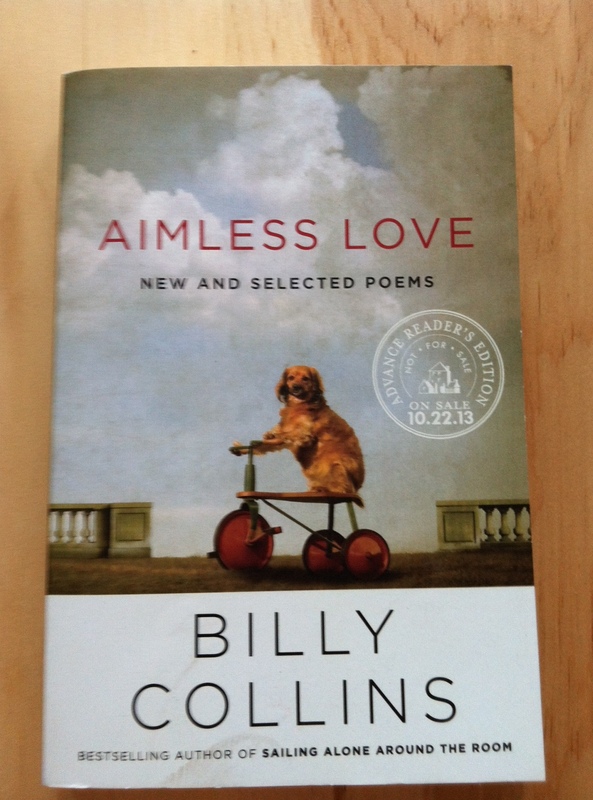 Aimless Love, a collection of new and selected poems due out in October, is no different. Here you’ll find a generous armful of poems from four earlier collections (Nine Horses, The Trouble With Poetry, Ballistics, and Horoscopes for the Dead), and about fifty new poems. In the selection of new poems, I found a misstep or two: “Looking for a Friend in a Crowd of Arriving Passengers: A Sonnet” was fourteen lines long (thirteen lines of four syllables, and one of three), but not interesting or funny enough to pull off the joke about not being a sonnet. “Unholy Sonnet #1” is painful in its riff on “Death Be Not Proud” (one of Donne’s Holy Sonnets, hence the title); Mr. Collins’s lack of technical acumen can’t be avoided; he even reaches into Donne’s oeuvre to find Donne’s once-used words, and these so eclipse Mr. Collins’s own efforts that I was rather embarrassed for the poem, and for him. Still, these are aberrations. For the most part, these new poems, like their predecessors, are pleasant, undemanding morsels, with a few gems tossed in (“Rome in June”). I’m all for accessibility in poetry, especially if it draws in new readers, and that, certainly, Mr. Collins can claim as an achievement. If you have the earlier books, you may want to check this one out of the library to see if you think the fifty new additions are worth the price of admission. You can find Aimless Love on the shelves on October 22nd. *A disclaimer: I received this book through LibraryThing’s Early Reviewer program. I was not compensated for this review, nor was the content of the review dictated or approved by any party. I love this: ” . . . the everyday business of being alive in America. As I’ve written elsewhere, his poetry is perfect for picking up on a whim, while you wait for a friend who’s late to dinner, say. You’ll be entertained, you’ll think, and you might even laugh, but you won’t be trying to unknot a metaphor half an hour later while you chew your escarole.” Works for me! I will look him up. He’s light without being unhealthy — like a fruit salad. I hope you enjoy reading! “Marginalia” is one of my favorites. I’ll try to check out that TED talk when I get a minute!